"The Association of American Railroads (AAR) today reported gains in October 2011 rail traffic compared with the same month last year, with U.S. railroads originating 1,215,627 carloads, up 1.7 percent, and 975,566 trailers and containers, up 3.6 percent. 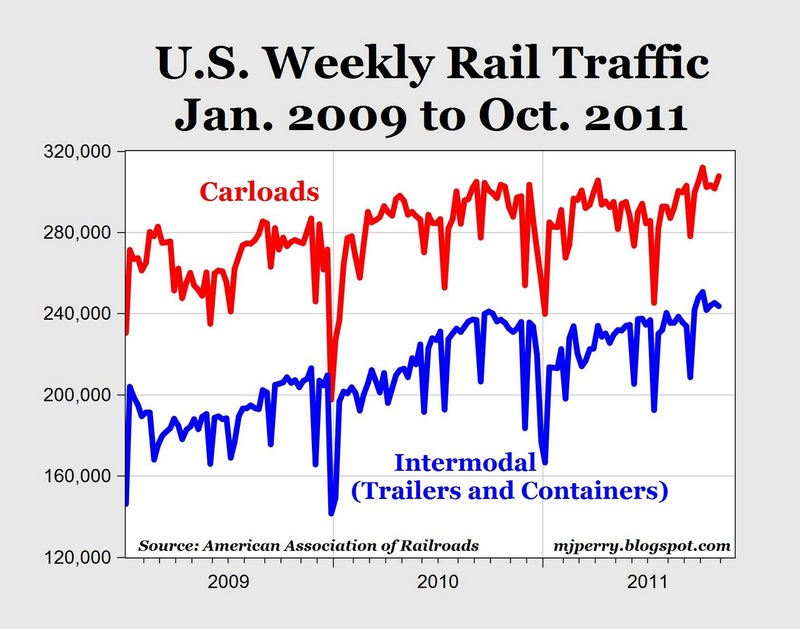 October 2011 saw the highest weekly carload average of any month since October 2008, as well as the highest weekly intermodal average since October 2006. Detailed monthly data charts and tables will be made available in the AAR’s Rail Time Indicators report to be released tomorrow. Today, AAR also reported gains in traffic for the week ending Oct. 29, 2011, with U.S. railroads originating 307,900 carloads, up 5.2 percent compared with the same week last year. Intermodal volume for the week totaled 243,774 trailers and containers, up 4.6 percent compared with the same week last year." 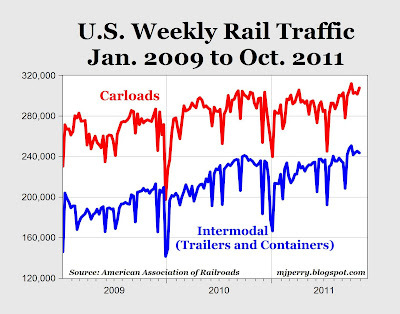 MP: The chart above shows weekly rail traffic for carloads and containers back to 2009. Except for a slightly higher volume in the first week of October, the 307,900 carloads shipped by rail last week was the highest weekly volume since 2008. Intermodal shipments remained above 240,000 for the seventh straight week for the first time since 2008. As an indicator of current and future economic activity, especially for the U.S. manufacturing sector, the steady gains in weekly and monthly rail traffic indicate gradual, but ongoing improvements in the U.S. economy. How do the Chicken Inflation Littles explain falling labor costs turning into runaway inflation? Oh, I know: Men from UFOs have taken over the BLS, and the Federal Reserve, and they are all conniving to hide the true rate of inflation. After all, Bernanke was seen stepping out of a Flying Saucer next to the Vince Foster murder site, on Halloween. once more, you demonstrate your basic ignorance of simple statistics. thus, whatever assumptions one makes about cpi are already baked into a unit labor number. this makes is meaningless to say "unit labor is down so there is no inflation". the reasoning is completely circular. productivity works the same way. if you understate inflation, you automatically overstate productivity and understate unit labor. you really do have a memory like an etch a sketch. How is it no one but you knows about this secret flaw in the CPI? And that others, such as Donald Boudreaux - George Mason University, say the CPi understates inflation? And why are there recent peer-reviewed articles in the American Economic Review that say the CPI overstates inflation? In an article in the June 2010 issue of the American Economic Review, economists Christian Broda and David E. Weinstein estimate that the Consumer Price Index overstates inflation by 0.8 percent per year. Morgan I realize a peer-reviewed article by a couple Phds in economics in the national economics bible means nothing, and that your hero crack-pots, cranks and fools at Shadowstats know how to really cook up the right inflation stats. My guess is that you shorted the Dow at 7,000 and now have brown streaks all over your exposed rear. Good luck. The copper price is still a better indicator. So far things are not looking that good. that's a total non sequitor and yet another appeal to authority from the village idiot. you made a circular augment. that was my point. unit labor is a function of cpi, therefore you cannot use it to make claims about low cpi. that's already baked in. the fact that you repeatedly make such claims demonstrates the fact that you have no idea what you are talking about. the fact that you are not even capable of understanding why it's wrong when it's explained to you shows that you are irretrievably stupid and really ought to limit yourself to bar stools as this data is way over your head. do you really not get that even if you had a perfect CPI handed down with absolute precision by the gods of economics, that you still could not use unit labor costs to validate it? you are literally arguing that because L x I = U and U is low that it validates that I is low. your alleged econ teachers must have despaired utterly of you. no one should get out of econ 101 with understanding so poor. “The cold has set in, and it looks like it might be a long winter for small-business owners. Still hunkering down, small-business owners reported a small, but overall reduction in employment, posting an average reduction of 0.1 employees per firm in October. ... The good news is that October’s jobs numbers are better than September’s (which showed a net decrease of 0.3 employees per firm), but still not good enough to lower the unemployment rate. ... Over the next three months ... a seasonally adjusted net three percent of owners planning to create new jobs. This is down 1 point from September and 2 points below August, the month that has, thus far, posted the strongest reading for 2011. For some context, in an expansion, this number should exhibit double digit readings." not much to cheer about there.